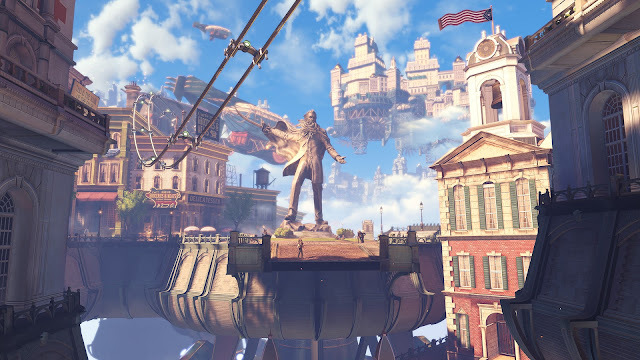 South City Hoosier: Thoughts on Bioshock: Infinite. Spoiler free. Thoughts on Bioshock: Infinite. Spoiler free. It’s difficult to critique a game that receives a lot of critical acclaim across the boards, especially from one of the few people in gaming journalism I still respect. 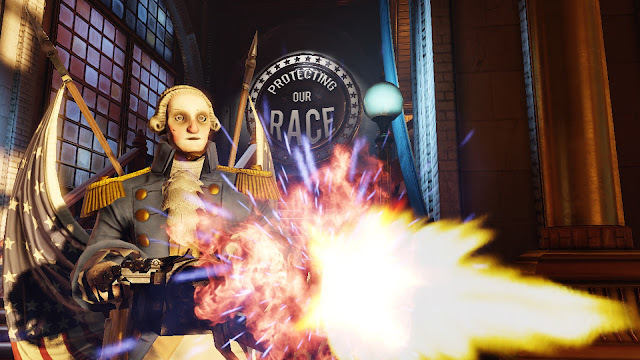 Adam Sessler of G4 and TechTV fame had nothing but good things to say about Bioshock: Infinite and his love is understandable. The game has an engaging story, interesting characters and level design detail that made me want to explore and find more and more history of the floating city of Columbia. It’s a fantastic mixture of science fiction and fantasy set in the early 1900s that doesn't rely on gimmicky steampunk to drive the science behind it. However, I have run into an issue where a game’s variety is truly what I look for. I have ten hours logged in Bioshock: Infinite and 86 hours in Borderlands 2. I've played hours and hours of Skyrim, the Fallout series and Just Cause 2 because they give me new and interesting ways to play a game each time I create a character. One of the greatest parts of Fallout 3 is deciding who you want to be from the start, based on various skills chosen by the player in the beginning. You can roll anything from a thief to a tank. Hell, you can even set up your role as someone who only uses high tech weapons and armor, or a guy who goes around and punches the crap out of everyone. Also present in these games is an open world element that allows the player to step away from the main story line and go exploring. This is a gaming double edged sword though. You can run around the island in Just Cause 2 and see plenty of sights, enemies and towns, but that variety means you aren’t going to have the detail and beauty of Bioshock: Infinite. Columbia is a floating city rendered beautifully. In the distance you can see fantastic architecture filling the screen with slow moving, yet impressive airships. However, that’s all it is. An impressive background you can watch from afar and never interact with unless the story is headed that way. Interestingly enough, my wife watched me play for a bit and one of her biggest pet peeves of gaming was mostly erased. Namely, the animations of on screen characters. Elizabeth has the look, feel and movements that are only rivaled by Disney animations, but it’s because much of her interactions are scripted. You mostly see her when there is some story to drive, but if you watch her movements during combat or while running from one place to another, she looks like every other on screen character. Basic running movements with little fluidity, hitting doors and walls at full tilt and not bouncing off with a broken nose and awkward looking head movements and steps while walking. Of course, this is very nitpicky of me. There are some great combat mechanics added to this game, mainly what you can do with the skyhook, and Vigor powers range from very useful to downright confusing, but you can pay to advance your favorites while ignoring the rest. The same goes for firearms, of which there are numerous choices. You can only hold two at a time, but I generally rotated between four unless Elizabeth wasn't so great on finding ammunition for me during a fire fight. I suppose I've been spoiled by open world games these days. I may or may not do another playthrough of Bioshock: Infinite in a year or so. I figured the game would be mostly story driven based on the two games that came before it, which makes writing a review difficult. It’s easily one of my recent favorites, and the great story and atmosphere makes up quite a bit for the linear driven storyline. I may have been a bit happier had I gotten it on a Steam sale, but I don’t regret buying and playing something that will easily be a contender for game of the year.